The compact size of this little wash light belies its intensity and versatility—the Blizzard HotBox 5 RGBAW offers massive light output from its seven 5-in-1 LEDs. 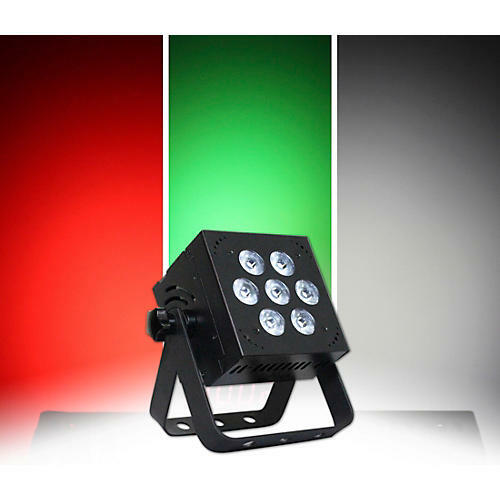 This powerhouse fixture offers phenomenal color mixing and advanced electronics that make it a perfect lighting solution for mobile applications. Powered by 15W RGBAW LEDs, this wash fixture delivers smooth color mixing, dimming, and built-in automatic operating programs, including sound active. Add to that the user-friendly 4-botton LED control panel and you’ve got a light that’s ready to rock right out of the box, leaving you with more time to focus on your performance instead of fussing with complex lighting setups. However, to really unleash the HotBox 5 RGBAW’s full potential and elevate your light show, you’ll want to take advantage of its DMX connectivity. No matter how you decide to use it, this compact is built to deliver a solid performance. And at a mere 3.5 lb. it’s small and light enough to transport and setup anywhere with minimal effort. You’ll appreciate the wiCICLE enabled DMX jacks, which lets you take advantage of Blizzard’s wireless DMX system without the need for external power. This innovative design provides power to the system directly from the fixture’s DMX jack, meaning even fewer cords and less setup time. Blizzard didn’t just pack this light with high-tech features, they also put a lot of thought into the housing. With its die-cast aluminum casing, the HotBox 5 RGBAW is ready to go to work and shrug off the dents and dings that come with professional use. Dual hanging brackets and secure grip locking knobs provide mounting options.